Carl Pritchard is the principal and founder of Pritchard Management Associates. And such an offer he has for you and your organization. As one of the world’s premier project management trainers, he’s offering a free one-hour webinar, exclusively for your organization, just for getting in touch and learning about the training programs Pritchard Management can put at your disposal. This isn’t a canned speech. It’s quality training for those willing to consider PMA. AND THIS MONTH, THERE’S SOMETHING NEW! SEQUENTIALLY!! 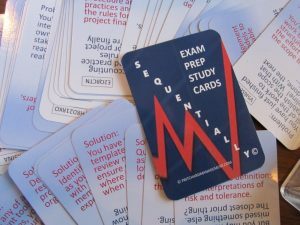 The PMP Exam Prep Sequencing Card Game. Want a little taste? Sequentially in Action on YouTube! Want a deck of SEQUENTIALLY to call your own? The PMP Exam Prep Sequencing Card Game. Want a little taste? Sequentially for sale on EBAY! He is recognized lecturer, author, researcher, and instructor. As a lecturer he is considered a leading authority on risk and communications. Keynote address required? Carl’s the guy. Want training with impact? Want training they remember? Live? GoToWebinar? Blended? Recorded? Carl has developed training and taught in virtually every format imaginable. He has also served project management in virtually every way you can! He is the U.S. Correspondent for the U.K. project management journal, Project Manager Today. He coaches individuals. He leads workshops for hundreds of people in a single setting. Who decides what he’s doing on any given day? YOU DO!! Carl will work with you to ensure you get everything you could have hoped for out of the training experience. He’s genuinely one-of-a-kind. What Can Carl Do For You? Pritchard Management Associates offers courses in project fundamentals, scheduling, cost management, risk, communications, presentation skills and PMP® Certification Exam preparation. PMA programs are dynamic, entertaining, memorable insights into the core skills of project management and open the door for hands-on learning that sticks. With topics ranging from “Lessons Learned” to “Team Motivation,” Carl can tailor his presentation to your organization, your goals and your specific needs. From an hour to a day (or longer), he’ll keep the audience engaged and active…participating and enthused. And he’ll work with you to ensure your message is woven into his unique style. PMI-RMP Prep CDs and MORE! Decision Model and Student Deliverables-Managing Multiple Projects Jul 2017 Students participating in the July 2017 Managing Multiple Projects training in Indianapolis, Indiana, developed a decision model, guidance on obtaining project commitment, and two separate protocols to enhance meeting performance and approaches.